We are back home after a little weekend getaway to Little Rock to visit my family. We didn't do just a ton while we were there. On Friday night Scott and I snuck out for a bit to go to the promenade and while we were there we decided to sit on a patio, listen to some music and have a glass of wine. It was impromptu and very nice! This week I'm in party planning mode. Campbell turns three on Sunday and we are having his birthday party that day. I don't have just a ton to do to get ready for the party but it always feels like a lot nonetheless. Campbell's birthday always falls around the week of spring break which means every year he's been out of MDO the week before his party. It's really not the best timing. What I could get done in one afternoon without kids will take me an entire week with kids! It's 80* here today and the first day of spring so I say it's okay to break out the shorts and flip flops! My Mom got Bennett this little Mud Pie romper and I think it is soooo cute! Summer clothes are definitely my favorite when it comes to dressing my babies. I posted a pic on my Instagram stories last week of me in Gap trying on a bunch of different clothes. I have never received so much feedback on my stories before. 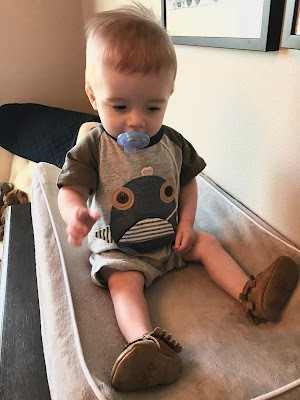 It seems as if all of us are trying to find some comfy, mom-friendly attire....plus a few impractical things that are just too cute to pass up! This isn't the best pic but here I am this morning after getting dressed in my new joggers that I just got from Gap. I'll link them HERE in case anyone is interested. 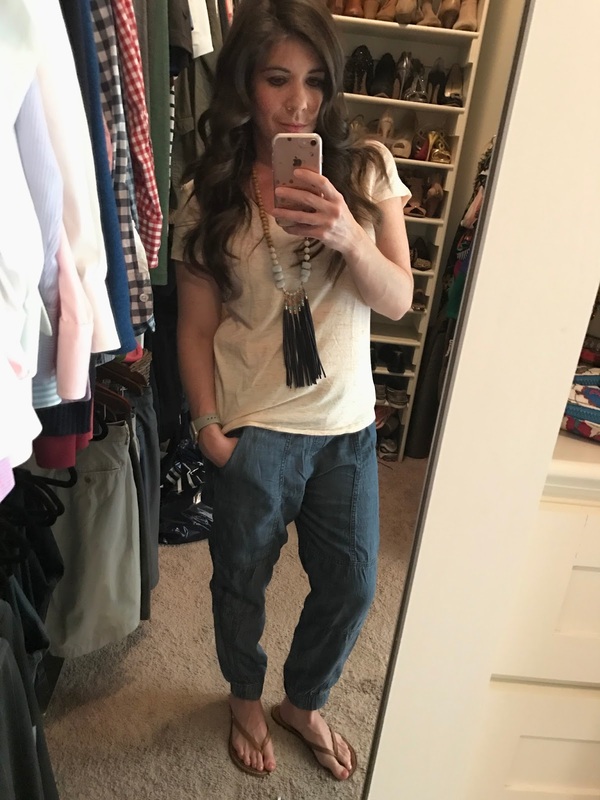 There's several different styles/colors (I got a few different ones) but they are so great, incredibly comfortable and just so perfect for my #momlife. The ones I'm wearing don't look as patchy in person as they do on the website...I hardly even notice them actually. And you'll want to size down in these. I'll try to take some good pics later this week but for now this mirror selfie will have to do!